Bolt appealed to me when it had its cinema run, but like so many animated films, sadly I didn’t actually get around to going to the cinema to see it. Signalling effectively the transition of Disney Animations from ailing production house playing second fiddle to Pixar to newly accomplished CGI studio in its own right with Pixar mastermind John Lasseter at the helm, Bolt had a lot to prove – but didn’t make anything like the impact of Wreck-it Ralph or Frozen...or, indeed, Tangled. But for all that it’s likely going to be consigned with Meet the Robinsons to ‘minor feature’ status for all time, it was a whole lot better than, say, Cars II. And I liked Cars II much more than most people did. 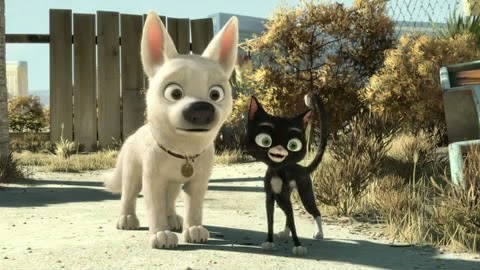 Something like Homeward Bound meets Finding Nemo with the delusional-ideas-of-own-abilities comedy from the first Toy Story, cute animal story Bolt has a bit of everything – comedy, action, sweetness, emotionally heavy notes, and quite a few sharp jibes at Hollywood, including an especially cutting and brilliant depiction of a manipulative agent. The story is that there is a successful TV show called Bolt, which is rather like Inspector Gadget but with Gadget and Brain merged. A little girl – who is even called Penny – gets into scrapes because a terrorist organisation is after her, but has her highly-intelligent dog for protection. Fortunately, Bolt has been enhanced to gain super speed, amazing strength, heat ray eyes and an incredibly destructive superbark. The real Bolt is the star of the show with his real owner, who wishes he could just be a normal dog – but that’s not possible because the director has mandated the dog truly believe what he’s doing is real. In other words, Bolt truly thinks he has amazing powers, and has an incredibly sheltered life – even for a dog. The show isn’t doing so well, so a network executive demands darker stories – which include a cliffhanger. Leaving Bolt genuinely distressed for his owner leads to him escaping in a rescue attempt and, as seems usual practice in this sort of story, getting knocked out in the back of a delivery van and being taken right across the States. Bolt at first believes himself depowered by the mysterious properties of styrofoam, but undeterred, goes to look for Penny. He asks some pigeons, who lead him to a cat that has been extorting them – cats being the underlings of the bad guy in the TV show. This alley cat – who turns out to have a genuinely very sweet yet understated backstory involving being left behind when her human family walks away, leaving her to fend for herself after having been declawed, is forced along for the ride, and after picking up a crazy fanboy hamster (who never seems to miss HIS old human for a second), they make their way to Hollywood. But will there still be a place for Bolt? In animation terms, it’s just a little dated and clunky now, especially the human characters, but the animal designs are very strong and the acting matches well. I had no idea that the actors were John Travolta and Miley Cyrus until the film ended, but both suited their roles extremely well. Also fun to see Malcolm McDowell voicing yet another crazy English bad guy. I don’t know why Bolt wasn’t more of a success. I guess that it needed a bit more scale to really draw in the crowds, but it benefited from keeping things small and simple – in contrast to its show-within-a-show. The humour was good, the music was good, the emotional parts were good and the payoff was good. I guess it was just that little bit too straightforward to stand out in the crowded market of kids’ American CG animated feature films. I think the reason it wasn't so successful was because there just isn't much in it for the general adult audience, unlike Disney's grand fantasy musicals or Pixar's innovative "out of the box" stories. As you said, it was a small-scale story, and unless you're a Disney/animation fan or really enjoy cute animals stories, I just don't see much in it that would grab a lot of adult viewers who take their kids to see it. But yeah, I think it's one of Disney's underrated films. It's not an amazing one that I'd want to see a lot of times, but I still think it deserves more attention than it gets.